harvest festival celebrated on the full moon day of the Hindu lunar month of Ashwin (September to October). It marks the end of monsoon. 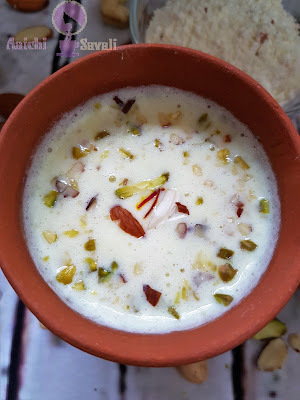 There is also a tradition to have Masala milk on this full moon night, milk is boiled until it thickens, and milk masala is added to it to make it aromatic and delightful and drunk. People believe that on this night Laxmi goes around visiting people, and shows her pleasure on those she finds awake. Hence, the night is spent in the celebration of something in a joyful and exuberant way, in honor of the goddess Lakshmi. It is also believed that on this day as the moon and the earth are very close to each other; the moon rays have certain healing properties of nourishing the body and the soul. Boil the milk in a deep non-stick pan. Once it comes to a boil, reduce heat and simmer for about five to six minutes, keep stirring continuously, till the milk reduces and thickens slightly. Add the saffron, cardamom powder, almond mix and sugar and stir to mix. Simmer for two to three minutes. 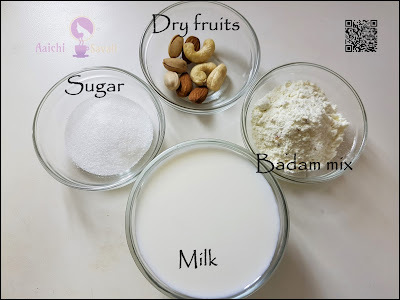 Garnish with the dry fruits. Here, healthy, aromatic and to celebrate kojagiri instant masala milk is ready to serve. Serve hot or cold. To make it aromatic you can add pumpkin seeds, black pepper, fennel seeds too. Diabetic patient, can skip addition of sugar. The masala can be prepared at home or bought in ready to mix packs available commercially. The typical ingredients are almonds, pistachio, cardamom, nutmeg, saffron, etc. Per serving contains 342 calories, along with carbohydrates - 51.1 g, dietary fibers - 1 g, fats - 9.9 g, proteins - 11.5 g.
Milk also helps to prevent osteoporosis, reduces blood pressure due to its potassium content. 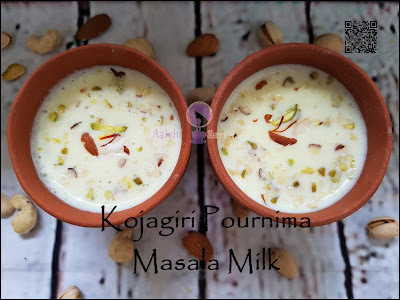 Masala milk is a great way of making milk tastier, especially for children who usually fuss about drinking milk. Masala milk powder adds to the sweetness and flavour of milk along with good amounts of protein and calcium. The presence of almonds and pistachio in the masala powder helps to enrich the milk with added health benefits like antioxidants, vitamin E and zinc. It's good to drink masala milk for breakfast or before go to bed.